The Tannoy Reveal 802 is the largest model in Tannoy's studio monitor line. We check it out if it's great for DJ use in this review. These capable monitors occupy a slot just a little below fully professional studio speakers that cost multiple times this amount… at this price, it’s a steal. Being big enough and serious enough to deliver the kind of bass that should satisfy any DJ, there is absolutely no need for external woofers, unlike with smaller speakers. Overall, like the smaller Reveal 402s, we love them. 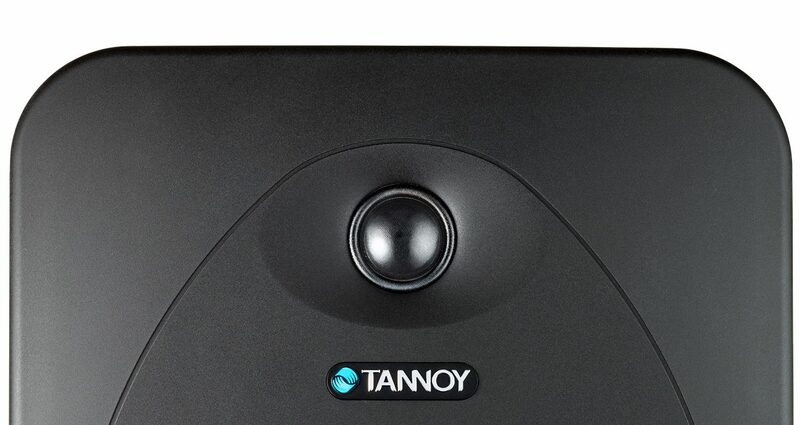 The Tannoy 802 comes with “Poke-Resistant” tweeters that don’t cave in as easily as other soft-domes: We tried, and they held on! They actually look almost exactly the same as the Tannoy Reveal 402s that we reviewed recently, but are altogether bigger, beefier, heavier, and certainly not designed to perch either side of a laptop, being 39x25x30cm in size. Nicely finished in rounded MDF and with sombre, workmanlike off-white 8″ woofers (hence the “8” in its name), plus recessed 1″ tweeters and a smart “Tannoy” logo on the front plus a bass port, they get a touch of flair with the “Tannoy” name recessed into the casing at the back on the right. Each speaker is bi-amped and they are, as is the case with all monitors once you get past the “glorified computer speaker” types, completely independent, with their own power supplies, audio ins and so on. However, the Tannoy does have a nod towards the way consumer powered speakers tend to be used nowadays, especially at home, in that there is an 1/8″ minijack in on the back, and a speaker link minijack too (long cable supplied), so you can plug your phone, iPad or computer in to just one of them and feed the audio to the other one should you wish. Apart from that twist, though, what’s here is broadly what you’d expect from a monitor solution: There are XLR (balanced) and 1/4″ jack (unbalanced) inputs (no RCA unbalanced here), a volume control, and a treble boost / cut switch which is meant to help with room positioning rather than EQing (the idea of course being that these units provide “true” sound, not something you can colour to suit the music / your mood…). Behind the 802 is a switch that lets you boost or cut the high frequencies to tailor the speaker’s brightness to your room. A balanced XLR and an unbalanced 1/4″ jack are your main inputs, along with an 1/8″ aux input. A bright blue power light on the rear of each tells you it’s on. We noticed less hum / interference than with the smaller 402s, where possibly due to the proximity to computer equipment it was noticeable (if not really an issue). However, what there certainly wasn’t less of was bass! These were a wonderful, warm, and punchy sounding pair of speakers, 100% suited to the kind of music us DJs typically play, with its synthesised, deep basslines. The low end was in no sense muddy, with clarity and poise. Moving up the frequencies, the mids felt subtle and by no means overpowering, meaning long practice or studio sessions oughtn’t be a strain. Likewise, the treble was refined, sophisticated, and far from being shrill. Maybe even a tiny bit TOO sophisticated, sounding… not dull, just very smooth at times. For DJing, that’s great (it makes you want to turn up, close your eyes and fly away…), for production, it’s definitely worth experimenting with the fine-tuning of the treble to get the truest sound in the room you’re using when set against how your results sound elsewhere. 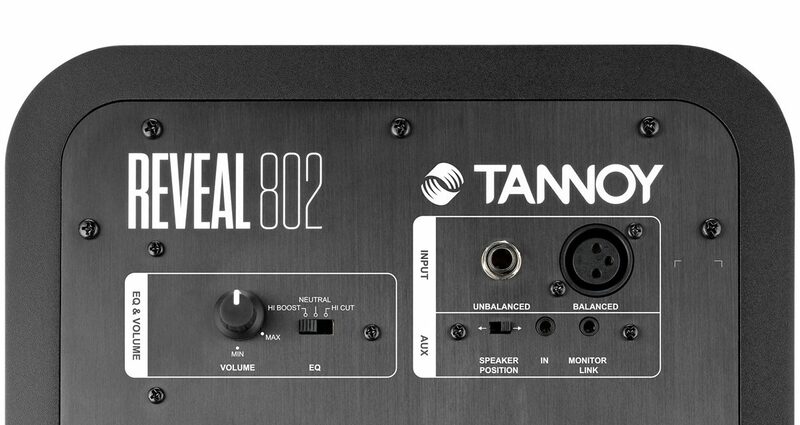 Whether for DJing or producing, the Tannoy Reveal 802s could very well be the only pair of monitors your home studio or DJ practice space needs. 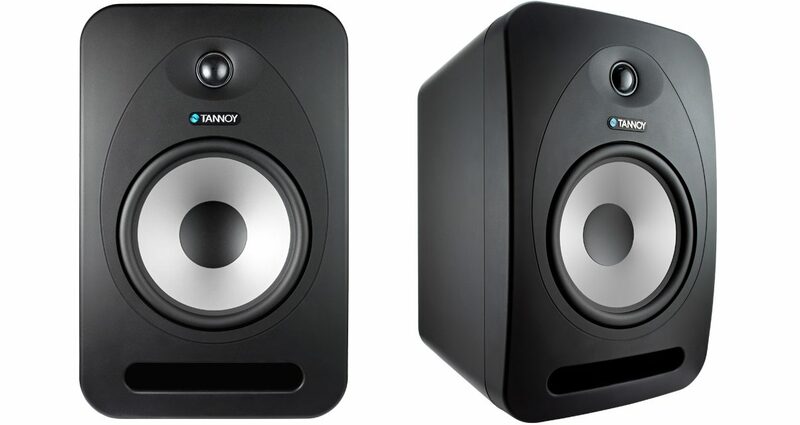 These capable monitors occupy a slot just a little below fully professional studio monitors that cost multiple times this amount… but not much below, and at a price that is frankly a steal. 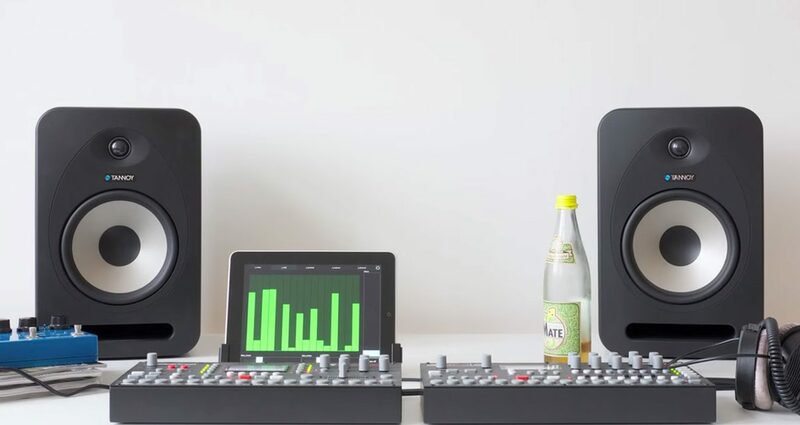 As such, they have just a small nod towards the fact that the user may well be using them for more than just monitoring (the 1/8″ minijack option and link cable), but apart from that they don’t compromise, being properly set up for serious DJ and production monitoring (bi-amped, independently powered etc.). Also, being big enough and serious enough to deliver the kind of bass that should satisfy any DJ, there is absolutely no need for external woofers, unlike with smaller speakers. Overall, like the 402s, we love them. They’re a different beast to the 402s due to their size, despite looking very similar, though; the 402s are great for bedrooms and small project studios where you’re constrained by volume and space considerations; the 802s, on the other hand, are quite possibly the only monitors any serious DJ/producer may ever need.